Following substantial expansion of the festival site last year, the changes to this year's master plan are less radical, but no less exciting. The late area - unique in European festivals - sees Arcadia ever ascendent, taking a larger field previously occupied by The Common. Expect to see upgrades to their incredible Spider stage, and more audience room for the field-packing fire show that wowed audiences last year with debut contributions from The Lord of Lightning. The Common meanwhile moves over to Arcadia's previous spot, and have been quick off the mark announcing a slew of new venues, including involvement from Medecins Sans Frontieres. Also new in the Common is Campo Pequeno, a bull ring made from old lock gates acquired by Michael Eavis in 2010. We're not expecting actual bulls (phew), but the organisers promise "Hispanic Mayhem" and "La Tomatina", the notorious spanish 'tomato fight festival'. Block 9 and Shangri-La stay put, with the latter evolving their epic dystopian city to include a sky walk..."We've run out of room, so we're expanding vertically" they told us this week. We hope to bring you more news of their exciting plans soon. As reported previously on GlastoEarth, we're told that the Leftfield stage will be going back to it's old spot next to the Leftfield tower. Current official maps say otherwise, but what we're hearing is coming from high up the festival organisation, so we're sticking with that for now. The same source also tells us that the Queens Head - without Q magazine - will be shunting over to a spot towards the Dance Village. Whilst the overall space inside the fence remains the same, campers will get a little extra space with Bushy Ground freed up from World Cup duties, adding another 10 acres of space in the new camping areas. For those of you with swanky but battery-hungry phones, there's encouraging news that there will now be two more phone charging tents - one near the meeting point, and another in Lower Mead towards the John Peel Stage. We don't expect these to make queuing a thing of the past though - bring your spare batteries and power packs to keep yourself juiced. Some of last year's new crew areas - a sore point for some finding their favourite spot out of bounds - have been better marked and scaled back. Last year's expansion displaced crew into Pennard Hill and Dragon field. The former area - which had a large space unused in 2010 - has been pared back, offering more room in this very popular camp ground. Dragon will again have public space at the top half, but with festival maps now showing this clearly and ending the confusion - if not the gold rush - for the festival's most secluded camping. We'll be keeping track of more changes as we hear about them. 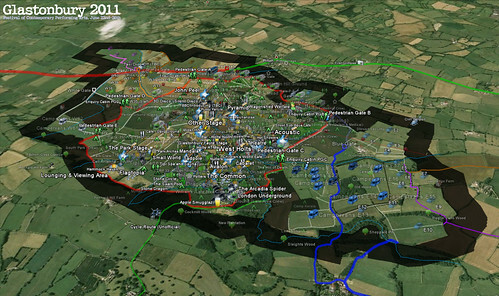 In the meantime, check out the GlastoEarth 2011 map - the most detailed map of the festival available.